On the Z13 design the wire from the contactor to the battery bus is recommended to be 6" or less. I don't want to put the battery bus on the fwf but on a panel with the other fuseblocks which will require a significantly longer wire. Is it acceptable or necessary to protect this wire with a fuse link and if so what size wire should I use? Max potential load will be about 15 amps. Does the main bus wire require similar protection? I'm using a 4.5ft length of 6awg for it. it's not a battery bus. Fuseblocks on the panel? Why? or breakers in flight? Have you read . . .
go cold when the master is OFF. �� it's not a battery bus. Fuseblocks on the panel? Why? �� or breakers in flight? Have you read . . .
�� go cold when the master is OFF. Note that he says *a* panel; not *the* panel. I can see the wiring logic in a single firewall penetration wire and multiple feeds on the cold side of the firewall from that battery bus. Perhaps there's a disconnect (pardon the pun) in how each of you is defining a 'battery bus'. I can think of at least one bus I'd want to bypass my master contactor: the engine bus for an electrically dependent engine that's using automotive style fuel injection. I fed mine using a fusible link to feed an engine bus switch, which feeds the engine bus. (With a switched alternate feed from the main bus.) 15 amps is a safe number for fuel pump, controller, injectors, coils, etc. I have no intention of messing with cb’s or fuses in flight. 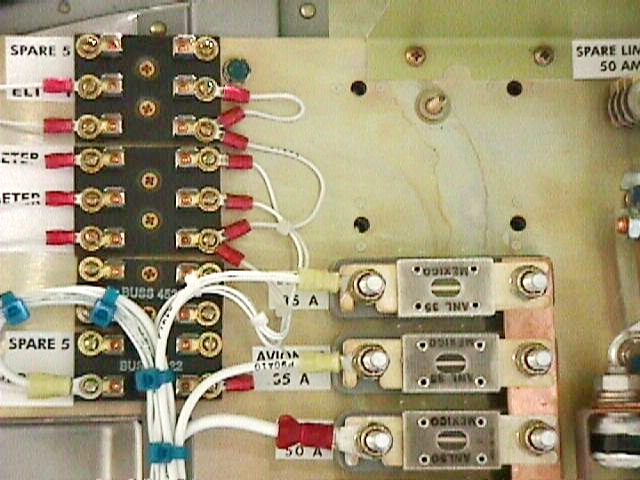 The fuse blocks are mounted on a drop down panel between the main and sub panels. I don’t want to mount the battery bus on the firewall but as this will require a longer wire does it now need protecting? Usually the main bus feeder does not have protection other than the ability for the pilot to shut it off via the battery contactor. As for the #14 AWG wire connecting the battery to the battery bus, an 18 AWG fuselink could be used. The 6 inch rule is a rule of thumb, not mandatory. The longer the wire, the greater the chance of it making sparks which will ignite gasoline after a forced landing. Protect it well. In this scenario, is there any reason why an ATC fuse bus (20 slot bandc type) could not be fed from batt and alt straight into the buss through two of the faston tabs? (As opposed to the main bolt terminal) Each slot could have a 30a maxifuse? What's the goal? If you're trying to protect the bus, it's an unneeded failure point when inserted as a 'master protection device' (detailed in Bob's earlier linked articles). If protecting the wire, the fuse is on the wrong end of the wire. 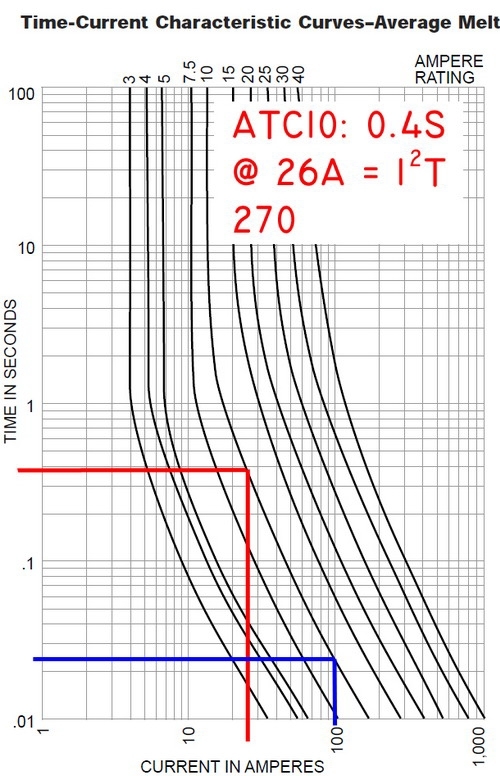 In this scenario, is there any reason why an ATC fuse bus (20 slot bandc type) could not be fed from batt and alt straight into the buss through two of the faston tabs?� (As opposed to the main bolt terminal) Each slot could have a 30a maxifuse? 10AWG feeder to the input stud on the fuseblock. What loads are being assigned to this bus? The bus is supplying the essential bus as backup max load approx 15 amps. A fast blow fuse will INSURE that the bus IS taken out. Do not use a fast blow fuse in series with the Bus no matter which end of the wire it is located. Will a maxifuse not blow as fast as a normal blade fuse? Is a slow blow blade fuse available? one end and a fuselink at the other. Is it not acceptable to do the same with the feed wire to the hot battery bus from the battery? I would prefer to keep the simplest, most durable protection devices within the engine compartment, ie a fuselink. it says, "MAXI 32V Series - MAXI® Slo-Blo® 32V Automotive Blade Fuse"
graph looks like the 30 amp fuse will hold 40 amps for several minutes without blowing. The reason that the endurance bus wire is protected at both ends is because there are two current paths. The wire needs to be protected from current coming from either end. A maxifuse is a blade type fuse, but it is twice as big as ATX and ATO fuses. question carefully . . . but I will soon. curves for the devices being cited . . .
"Fast" and "slow" are un-quantified, squishy terms. A #18 AWG fuselink will conduct up to 82 amps before it melts. No . . . and here's why . . .
approx ONE FOURTH that time or 0.1 seconds. 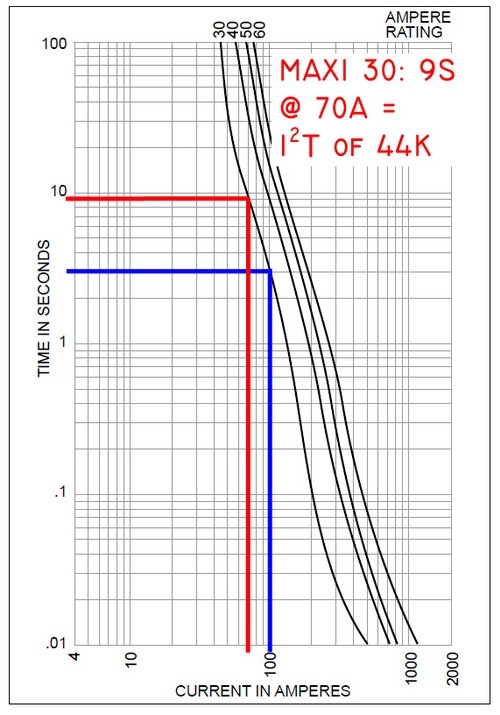 anticipate fuse operation in ~0.05 seconds. shortens the operating time by 1/4th each doubling. the order of 3 SECONDS. integrity of the bus feed is not at risk. 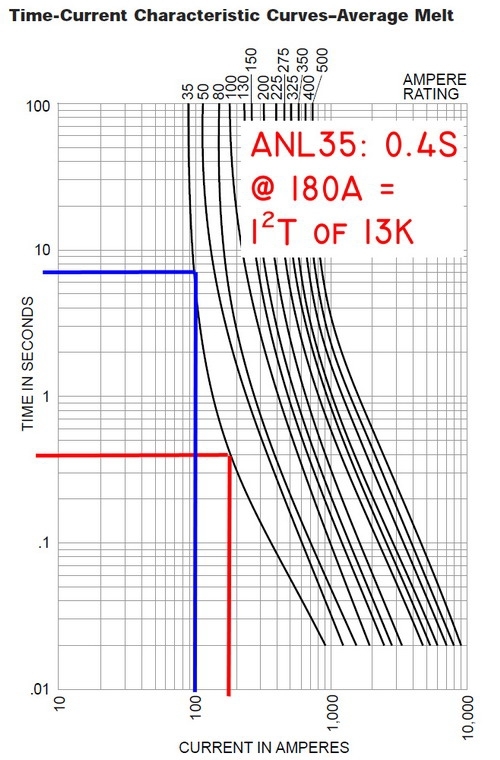 we might choose to use the ANL35 current limiter. A take-away from this narrative has several points. overload point than the MAXI with a Kf of 44K. in the demise of N811HB . . .
10A . . . with most probably being smaller . . .
even a MAXI40 protecting a 10AWG feeder. bus was located near the battery. of no problems with this design philosophy. Bob, thankyou for your reply, much appreciated. thanks sorry for late reply. So in this case we are talking about your Z16 circuit diagram without an endurance buss. (I have eliminated the endurance buss. Following your dictum of no electrical systems which determine the safe termination of the flight I have Levil with battery back up for AI/flight instruments and a handheld radio). Since the battery and therefore the battery contactor is under the baggage bay of my Europa, the power to the buss comes from one of the through-firewall bolts which connects the 4AWG from the battery to the starter contactor. Following the Z16 therefore, in this case, there is no requirement for wire protection between the through firewall bolt and the buss. The cable run which is 10AWG is not more than 12". The buss powers a dynon system with dual axis AP, radio/intercom, Airmaster prop, flap motor, backup instruments, fuel pump, landing and anti collision lights (these latter are low consumption LED). The dynon ammeter shows 12A recharging and 8.5A normally with everything on. In this scenario, is there any reason why an ATC fuse bus (20 slot bandc type) could not be fed from batt and alt straight into the buss through two of the faston tabs?Â (As opposed to the main bolt terminal) Each slot could have a 30a maxifuse?